We like to watch Diners, Drive-Ins and Dives and often try to include restaurants featured on the show in our RV travels around the country. This is how we found a wonderful sandwich shop in Albuquerque called Bocadillos because we were visiting the Indian Pueblo Cultural Center and there was a Diners, Drive-Ins and Dives location almost across the street. The Bocadillos restaurant is a small and unassuming metal building. From the street you would never know they served the best sandwiches made from the most amazing slow cooked meats. My favorite is their Duke City Reuben. It is an amazing sandwich but I do not have an oven in my RV nor the 12 hours to slow cook the meats. 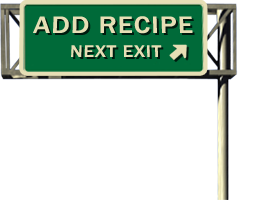 So I set out to create a more travel friendly version I could make in the RV from store bought ingredients and a secret I always like to keep in my pantry. The green chile powder in this recipe is not required but I think it makes this sandwich extra special and one step closer to the Bocadillos version. A tablespoon or two of roasted and chopped green chile would be even better but the powder is much easier to keep handy in the RV pantry to grab at any time. If you are ever in the Albuquerque area go see Marie Yniguez, co-owner of Bocadillos, at 1609 Indian School Rd NW, Albuquerque NM 87104 near 12th Street and Menaul. This amazing woman makes over a thousand charter school lunches every weekday before opening up the sandwich shop for the lunch crowd. Parking behind the restaurant is very limited. Small RVs can park behind the Lottaburger next door. Larger rigs will need to take the tow car or park in the neighborhood side streets. Butter one slice of bread and place it butter side down in a frying pan. Spread mayonnaise on the bread and sprinkle with green chile powder (available as plain powder or as a seasoning in specialty stores). 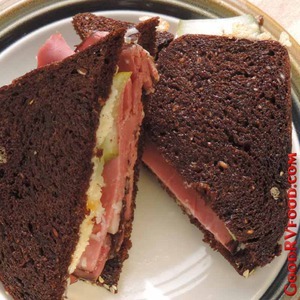 Layer pastrami, pickle and cheese then cover with another slice of bread. Butter the top side of that slice. Put a cover on the pan and cook over low heat until the bread is browned on the bottom, flip over and cook until the cheese melts. Watch it carefully to prevent burning. If your pan is big enough you can do two at a time, but we find this so rich that a half sandwich is enough for both of us to split. Serve with a side of coleslaw or better yet put some slaw in the sandwich.